My mother likes her artichokes pretty plain, and I do too. I won my son and husband over to them with this roasted garlic butter. I made these artichokes on our recent trip to visit my sister and her husband at their new home in Cincinnati. It was her husband’s first time eating artichokes, so this felt like one of those small family induction ceremonies. I think he liked them. A note on eating these artichokes: Start with the outer leaves. Leaves go in your mouth outside-up and downside-in so you can scrape the flesh from the lower parts of the inside of the leaves with your bottom teeth while discarding the fibrous upper parts (i.e. anything that doesn’t scrape off with your teeth). This will make more sense as you do it. As you proceed toward the center, the leaves will become more and more tender until you reach the (inedible) choke, an unmistakable mass of tightly packed, short spiky stuff in the center of the artichoke. When you get to the choke, scoop it out with a spoon leaving the heart, i.e. the round bottom of the artichoke, bare of leaves and choke. Pour any remaining garlic butter over the heart, cut into small bites (the better to make it last) and enjoy. Put a large pot of well-salted water on the stove over high heat. You need enough water to cover the artichokes about halfway. Prepare the artichokes by trimming the stem so each artichoke sits flat, and then cut about 1 inch off the tops of the artichokes. Flip the artichokes over (top/leaf side down) and give them a couple of good bangs on the cutting board. This will loosen the center, which you will now gently open. Cut the lemon in half and rub all the cut edges with the flesh of the lemon. Cut the 1/2 lemon in half and place it in the pot. Whack the peeled cloves of garlic with the flat side of your knife. Tuck the garlic into the center of each artichoke. Put the prepared artichokes into the pot, reduce the heat to simmer, then cover and cook 45 minutes to 1 hour. When you can easily tug off one of the outer leaves, the artichokes are done. Remove the cooked artichokes from the pot and drain them. 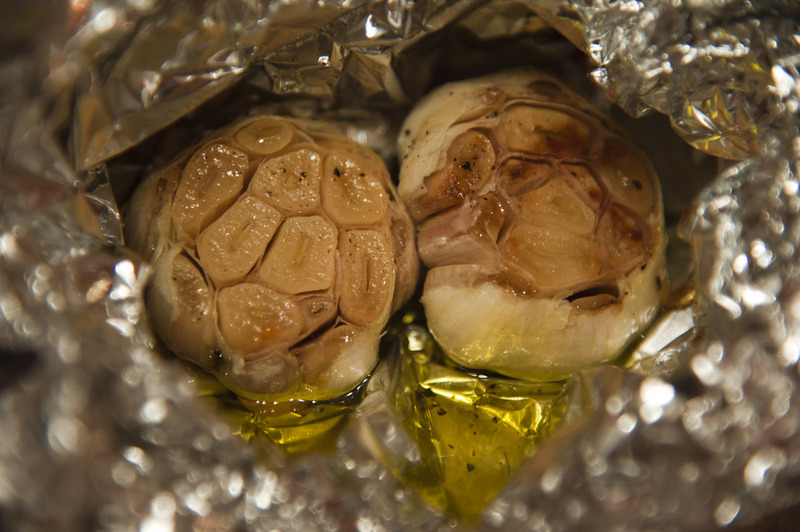 Prepare the roasted garlic dip while your artichoke is cooking. Preheat an oven (or toaster oven, or grill if you’re grilling that day) to about 350 degrees. Cut about 1/2 inch off of the tops of each head of garlic leaving the cross-section of cloves exposed but the skin on the rest. Place the heads in the center of a piece of 12″x12″ aluminum foil. Pour the olive oil over both heads and season with salt and pepper. Crimp up the aluminum foil so it seals completely. Place the foil pod into the oven and roast for 35-40 minutes. After 35-40 minutes, remove the foil pod from the oven, open the package and allow to cool slightly. When the garlic is cool enough to handle, squeeze the roasted cloves–along with the olive oil they roasted in–out of their skins and into a serving bowl. The lightly browned and nutty smelling cloves should mush out pretty easily at this point. I use the aluminum foil for squeezing, which (kind of) prevents my hands from being covered in flaky garlic skins. Pour the melted butter into the serving bowl and stir to mix, mash any large chunks lightly with a fork. 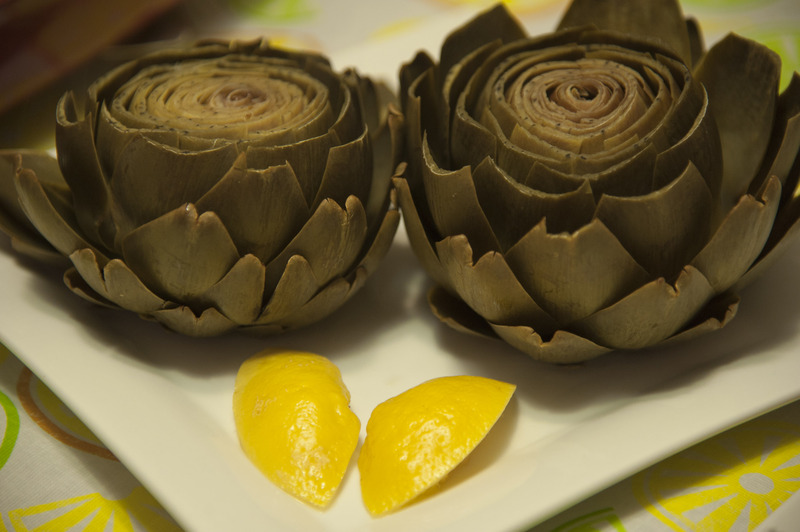 Serve the artichokes with the roasted garlic butter for dipping and a plate for discarded leaves. You’ll want to include a fork so everyone can fish buttery pieces of garlic out of the dip. And napkins or paper towels. This is finger-food.